The PCV valve is recommended for change every 60,000 miles (96,000 km) or every 4 years. The PCV valve (Positive Crankcase Ventilation) routes crankcase vapours back into the combustion chamber to be re-burned. A faulty valve will increase crankcase pressure which causes poor idle speeds and can affect engine performance and increase oil consumption. Fits all 1.6, 2.0, 2.4 and 2.4 litre Turbo PT Cruisers 2000-2010. 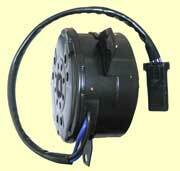 Click here to see the PCV hose. This anti-pollution hose is part of the PCV (Positive Crankcase Ventilation) system and connects the air filter box to the valve cover. Like the PCV hose, any leaks or blockages can lead to emission test failures and performance problems. Fits 2.0 and 2.4 litre PT Cruisers 2000-2005. Replacement clutch assembly including the clutch release bearing for the PT Cruiser. Fits all 2.0L & 2.4L petrol models from 2000-2010. 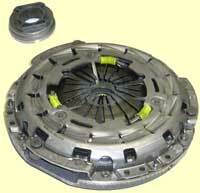 Replacement OEM Clutch Assembly for the 2.2 CRD Diesel PT Cruiser. Fits all 2.2 CRD PT Cruisers from 2002-2010. Dual mass flywheel for the 2.2 CRD PT Cruiser. 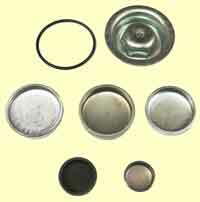 Diesel powered cars use these flywheels to absorb the engine’s high torque and help smooth out vibrations. They link the engine to the clutch and are basically two flywheels separated by springs. They are not considered to be a problem on PT Cruisers, but should be checked for excessive lateral and rotary movement whenever the clutch is changed. Fits 2002-2010 2.2 CRD PT Cruisers. Replacement clutch master cylinder for the 2.2 CRD diesel PT Cruiser. Although the slave cylinder is usually the cause of problems with the clutch hydraulics, it is often recommended that the master cylinder is changed at the same time. Fits 2.2 CRD PT Cruisers 2002 - 2010. Replacement clutch slave cylinder for petrol PT Cruisers (without pipe). Fits 2.0 & 2.4 litre PT Cruisers 2000-2010. Replacement clutch slave cylinder with pipework for petrol PT Cruisers. 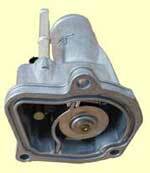 Fits 2.0 & 2.4 litre PT Cruisers (not turbo) 2000-2010. 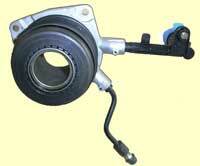 On the 2.2 CRD Diesel PT Cruisers the hydraulic clutch slave cylinder and the release bearing are a combined unit. Problems, like the the clutch not disengaging, are most likely to be due to failure of this unit. Some garages recommend changing the clutch master cylinder at the same time - which we also keep in stock. Fits 2.2 CRD PT Cruisers 2002 - 2010. If your PT Cruiser is a 2005 model please include your chassis / VIN number in the "Any message here" box at the checkout. 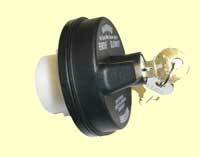 Replacement lockable fuel filler cap for the PT Cruiser, supplied with two keys. Fits all 1.6, 2.0, 2.4 & 2.2 CRD PT Cruisers 2000-2010. Engine oil filler caps for the PT Cruiser. Replacement pressurised coolant / radiator cap. Replacement water thermostat and rubber gasket. Fits 2.0 & 2.4 litre PT Cruisers 2000-2010. 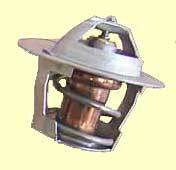 Thermostat for the diesel PT Cruiser which includes the housing, gasket and coolant temperature sensor. The thermostat is actually built into the housing and is not available as a separate item. 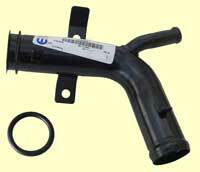 Fits all 2.2L CRD diesel PT Cruisers 2002-2010. 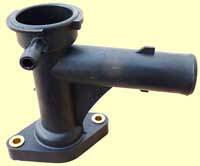 Replacement water pumps with gasket for PT Cruisers. The 2.0 and 2.4 litre pumps are driven by the timing / cam belt. The 2.2 litre diesel water pump fits on to the power-steering pump. Replacement Radiator Fan Motor. Fits 2.0, 2.4 & 2.2 CRD PT Cruisers 2000-2005. NOTE: This radiator fan will also fit the 2006-2010 PT Cruisers but the plug will need to be cut off and the three wires then connected to the three existing wires. 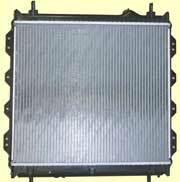 Replacement radiator for 2.0 & 2.4 litre PT Cruisers. Replacement radiator hoses for 2.0 & 2.4 litre PT Cruisers. Replacement set of two heater hoses for the PT Cruiser inlet and outlet heater pipes. Fits all 1.6, 2.0, 2.4 & 2.2 CRD PT Cruisers 2000-2010. Replacement metal heater pipes. These pipes are at the front of the engine compartment, between the radiator and the engine. Usually they do not cause any problems, but there have been a few cases where they have visibly rusted badly and started to leak coolant.